Gąsawa went down in history as a meeting place of the dukes of the Piast dynasty in 1227. 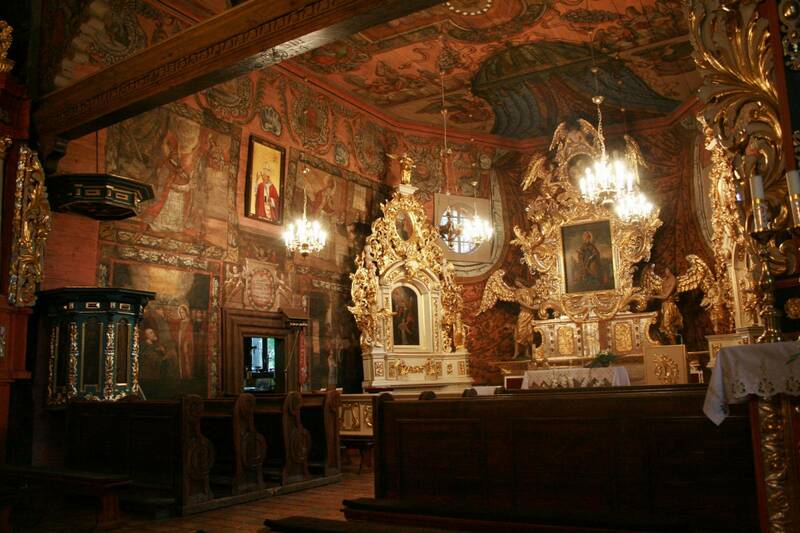 Visitors to the village are delighted by the local wooden St. Nicholas’ Church – a masterpiece of sacral art. The exterior of the building is rather inconspicuous, but inside we can admire the stunning Baroque paintings. The present church was built in around 1625 by Canons regular from Trzemeszno; however, it is known that the first parish was established at the turn of the 11th century. 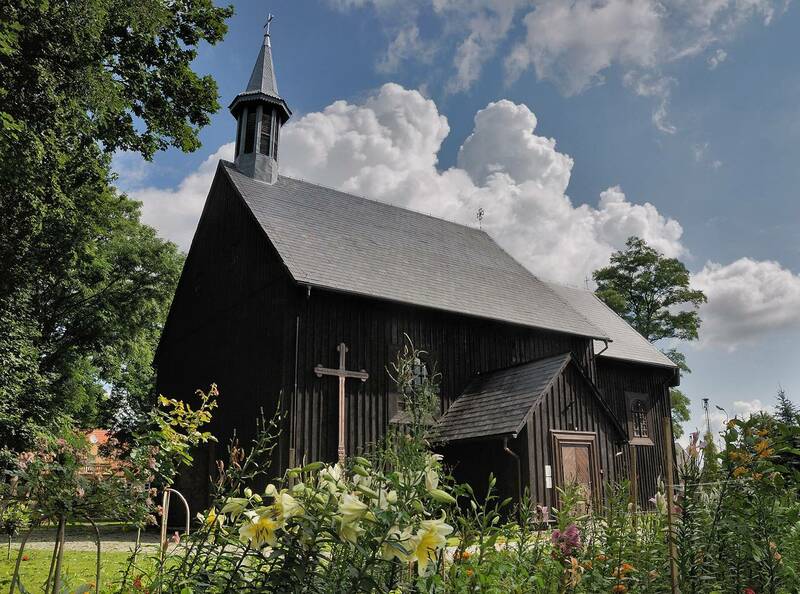 The church is a shrine with a larch-wood log-frame structure. In around 1850 the church was going to be pulled down due to its poor technical state, but the Prussian authorities did not allow it. The local community had enough money to renovate the building, but they could not afford the renovation of the wall paintings, therefore they were covered with reeds and plastered. They were forgotten for 150 years. In 1939–45 the Nazis used the shrine as a grain warehouse, but in 1948 it was fully renovated. The series of wall paintings – similarly to the unique Gothic arrangement of the framework beams – were discovered only during the renovation of the roof and the external walls which took place in 1998–99. 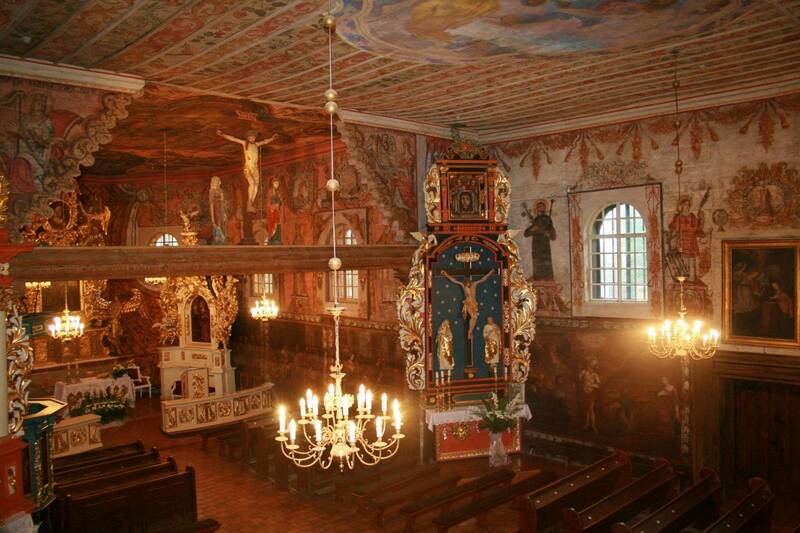 Although the interior design presents a range of styles – from Late Gothic, through Baroque, Mannerism, and Classicism to modern times – it is the unique series of Baroque wall paintings discovered at the end of the 20th century that charms visitors the most as they cover 700 m2 of the interior of the church. The paintings come from four different periods and their present form dates back to the 18th and 19th centuries. The best-preserved layer is from 1705–06, but two other layers have been identified from the 17th century and one from the period when the Chapel of St. Anthony was built (1817). 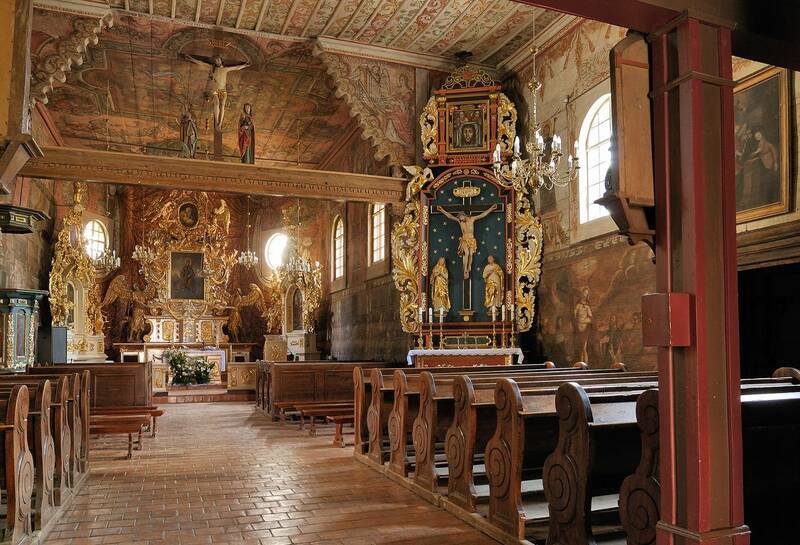 The paintings are of a consistent and precise artistic composition: all the motifs are of natural size and the characters have natural proportions, which gives visitors the impression of being in these scenes when entering the church. As for the interior design, what draws the attention is the main Late-Baroque altar from the first half of the 18th century with a miraculous picture of the Mother of God wearing a silver embossed dress. Because of this painting, the church was named the Shrine of Our Lady of Consolation. It is an image of the patroness of the Canons regular. The painting has Baroque features and was probably created in the second half of the 17th century (in 1674 it was already in the church). The miraculous painting has a moveable curtain that presents a 19th-century depiction of St. Nicholas – the patron of the church. The Marian devotions in Gąsawa, which used to be intense (as proved by ecclesiastical documents), are now only of a local nature. Another precious monument is the Manneristic baptismal font from the beginning of the 17th century, which was previously in the church at the Dominican monastery in Żnin. The oldest element of the church furnishings is the Late Gothic Group of Crucifixion from the first half of the 16th century. It is also worth having a closer look at the Baroque side altars. On the right there is the Altar of the Holy Cross from the 17th century, whose sculptures are of a high artistic standard. The cylindrical Chapel of St. Anthony adjoins the nave. Outside there is a bell tower from the turn of the 18th century. It is wooden, has two levels, and is covered with a tented roof. At the gate leading to the church there is a stone statue of the Mother of God, which comes from 1866.